Whatever happened to the automated home? Why don't we all have automated homes? Back in 2005, Popular Mechanics magazine showed off the home of the future, which took advantage of the latest technologies to automate almost everything. "There's just about nothing in the home that can't effectively be controlled automatically," the family living in the house enthused. It's all very impressive – but then, it was even more impressive when Popular Mechanics covered exactly the same subject in 1939. We've been hearing about automated homes for 70 years but, despite the wonders of our wired world, most people's homes are thoroughly low-tech. So what's the problem with the automated home? Is it us, or is it the technology? The automated house of 1939 was surprisingly similar in vision to the automated house of 2009. "Electric ranges already are equipped with automatic controls for temperature and cooking time, but there is no practical reason why these operations together with the other applications cannot be controlled remotely from any room in the house,"
George H. Bucher predicted. "The future home will probably be equipped with a number of control centres, from any one of which the homemaker can give her commands. "While many of George's predictions in 'The Electric Home of the Future' (Popular Mechanics, August 1939) came true – including TV and radio "[moving] the amusement centres of Broadway and Hollywood right into our living rooms" and homes with "some electrical means of recording news reports and pictures as soon as the news happens" – you're still more likely to see automated homes on MTV's Cribs than in Cricklewood. To be fair to Bucher, forecasting the far-off future is never easy. But what about more recent predictions? 'Imagine this,' says Adrian King, President of ICL's Retail System Division. 'You're in the kitchen and notice that you are running low on eggs. You swipe the carton past the barcode scanner, which makes a note on its personal shopping list. You do this for all the items that you need. When you're ready, you send the list to a nominated supermarket who can then make up and deliver the order to your home.'" The article also quoted NCR's Stephen Emmott, who said: "The next stage in computing is one that is moving computing devices beyond the desktop into everyday appliances including washing machines, fridges, telephones and clothes. We'll see intelligence embedded into everything we come into contact with." 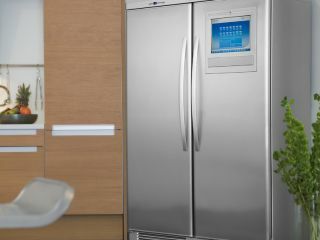 So, it's time to put your hands up: who owns a Screenfridge, a net-connected microwave or Wi-Fi pants? Nobody? That's what we thought. Current page: Why don't we all have automated homes?